Andrea Cote ’21 may be a triplet, but this Chelmsford, Massachusetts native is having no trouble standing out on her own at UNH. 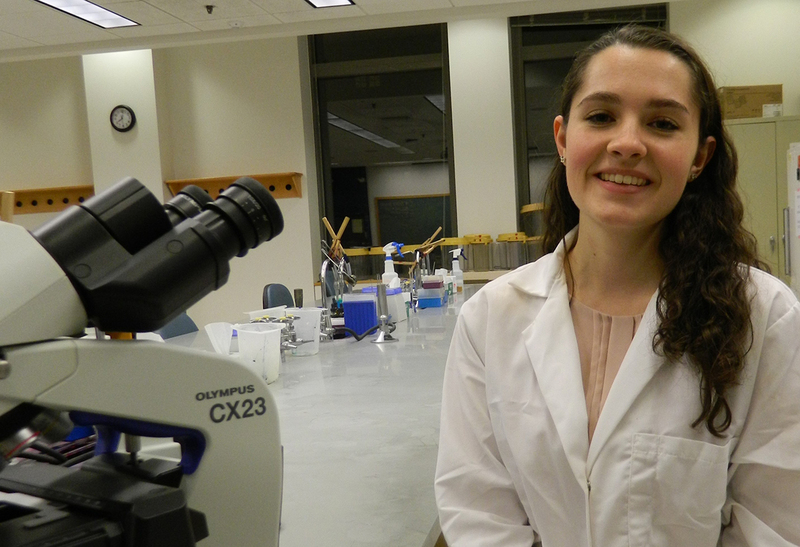 The biochemistry, molecular and cellular biology major has been conducting research in a faculty lab since her freshman year and is now developing her own research project on treatments for colorectal cancer. Andrea Cote: I am most proud of my work in Dr. [Brian] Barth's acute myeloid research lab on campus. I was so proud of myself when I was offered a position in the lab after just one month here at UNH. It felt absolutely amazing to be a freshman who was already gaining valuable experience in my field of study. Now, as a second-semester sophomore, I am working on developing my own research project in the lab studying the effects of Alaskan medicinal ethnobotanicals on colorectal cancer. Cote: I am motivated by my support group of amazing friends and family who always believe in me and my ability to succeed. I am motivated by my family's history with cancer. This horrible disease has hurt and taken the lives of too many of my loved ones. As I excel in my studies and further my research in oncology drug discovery I hope that I am doing my part in fighting back. There are great opportunities on campus to join ongoing faculty research, and many of my peers and I have benefited immensely from the experience we are gaining already working in a biomedical research lab. I am certain that I will graduate UNH with a very solid and experience-rich understanding of cellular biology and oncology research. Cote: Biochemistry, molecular and cellular biology encompasses all of the areas of science that interest me most. I have held a passion for science since my earliest elementary school classes, learning about the water cycle and watching plants grow in our terrarium. My relationship with science became personal as my family repeatedly battled with cancer. This influence, combined with my new love for molecular and cellular biology, lead me to my career path today. Cote: Don't be afraid to jump right in and pursue the opportunities that you want. Take your dreams and goals and work with peers and professors to make them a reality. It may sound daunting or nearly impossible at the time, but if I've learned one thing it’s that often those opportunities are a lot closer than they may seem. They're in your reach, you just have to have the strength to reach out! Cote: After graduation I hope to pursue a master’s or PhD in cellular biology. My end goal is a job performing oncology drug discovery research at a biotech company that I respect. I see myself working as a team at the lab bench each day, working to discover new vital cancer therapeutics. Cote: I am lucky that I already have my hands in an oncology drug discovery laboratory. In combination with my courses, I am certain that I will graduate UNH with a very solid and experience-rich understanding of cellular biology and oncology research. Cote: UNH allowed me to jump right into gaining experience in my future career. When I left high school, I knew one thing for certain that I wanted to do in college: work in a lab. There are great opportunities on campus to join ongoing faculty research, and many of my peers and I have benefited immensely from the experience we are gaining already working in a biomedical research lab. It gives me confidence that I will be prepared for graduate school and in securing a position at biotechnology company in the future.